At SendGrid, we are privileged to interact with inspiring groups across various communities. 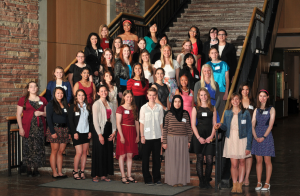 NCWIT (the National Center for Women & Information Technology) is an organization that vibrantly stands out. Recently, two separate events allowed us to further our relationship and involvement with them. Within NCWIT, the Aspirations in Computing program meaningfully engages high-potential young women in tech. 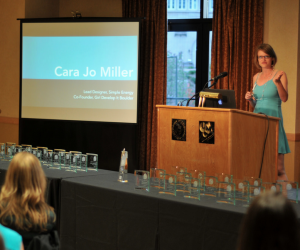 Every year, the program honors high school level young women for their computing-related achievements. Award recipients are selected based on a variety of factors: technology and computing ability, leadership skills, academic history, and plans for post-secondary education. Consequently, they receive visibility into local tech communities with scholarships, internships, research experiences, employment opportunities, and beyond. In the beginning of April, we hosted a small tour group for NCWIT Colorado Aspirations Affiliate winners and runner-ups at our Denver office. A group of young women and their parents eagerly filled the office with their presence as our Manager of Recruiting and I led a tour. The girls seemed enthused by SendGrid, our engineers, and the overall office environment, which mirrored our excitement over their energy and optimism. In addition, near the end of April, one of our engineering team leads and I were fortunate to attend the Colorado Aspirations in Computing Award ceremony. The event was a beautiful celebration composed of ample smiles, motivational speakers, and of course, honoring the elite award recipients. It was a true honor to be in a room filled with, as our team lead put it, “Fifty Monicas” (our fabulous two-time summer intern, Monica Mishra, who won the 2012 National Aspirations in Computing Award and 2013 Colorado Aspirations in Computing Award. You can read more about Monica in our SendGrid Spotlight blog post featuring her here). We are thrilled to be a part of the NCWIT family and partner with them on changing the ratio of women in technology. We look forward to next year’s office tour with even more girls and another fabulous award ceremony. For more on our relationship with NCWIT, read our blog post SendGrid ‘Sits’ With NCWIT and Girl Develop It Boulder. Emily is a member of SendGrid's People Operations (a.k.a. HR) crew. She’s a spicy food, Netflix binge, and love-where-you work enthusiast.